Despite the fact that every member of my immediate family has lived in the Bronx at some point, I didn't grow up in a baseball-loving house. It happened when I was about fourteen. My sister fell in love with Derek Jeter, and my mother admitted she'd always loved the Yankees. To my completely-non-athletic self, it seemed to come from no where. All of a sudden, one day, the Yankees were on the TV. 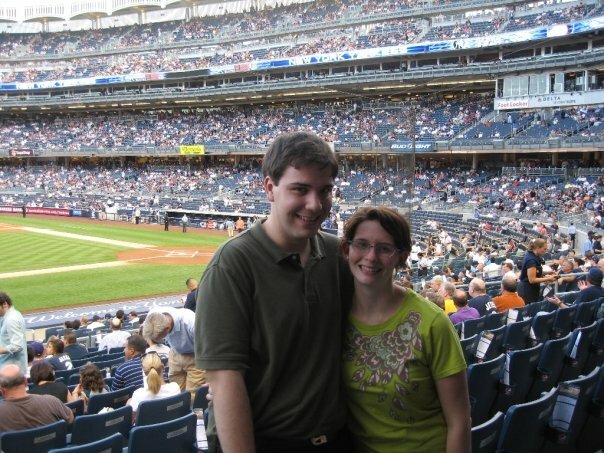 The next, my sister and my mother had an infinite supply of Yankees T-shirts. On the third day, they had seasons tickets, and two of my family members went to every single Sunday home game for about five years. It was rare that I was one of those two. Mostly, I was a sub, warming the bench (you know, our house) until my mother really, really couldn't find someone to go with her, or her boss gave her a set of four tickets and I was allowed to bring a friend. It happened about once a year, and I was mostly bored to tears. When they closed the old stadium, my parents were at the last game ever played there, and although they decided not to get seasons passes at the new stadium, they went to the first game ever played there, as well. When I went to my first game at the new stadium, I truly couldn't tell the difference from the old one, which had never looked very different from Shea Stadium to me, either. 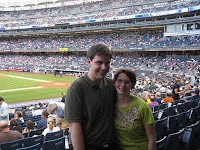 Heresy, I know, but that should give you some idea of how truly not into baseball I was. When Roger and I went to our first game together, we had killer seats, like $325-a-seat seats (thanks, mom's boss! ), and it was still just a fun outing, and not much more. Even my love for Americana-kitsch couldn't get me to really enjoy a baseball game. My father's self-portrait as a hot dog. So, I'm not 100% sure what changed on Sunday, but I had such a wonderful time. It could be that my friend Kevin caught a foul ball a few days earlier and tweeted, "Boyhood dream come true." It could be that my coworkers are invested in the games (one was celebrating her two-year-anniversary at the game on Saturday, and two others use Yankees water cups everyday). It could even be that I am reading a Stephen King novel (coincidentally, for the first time since I was about 14) and he loves the Red Socks and we were playing them, and, um, who doesn't want to see the Yankees play the Red Socks? Yay tradition and team spirit and rivalry! I think what it really was, though, is that I put some effort into it. For the first time, I put on a pinstripe hat, I ate a hot dog, and I decided, This is the day I figure out when to cheer. And I did. Sure, I never quite got excited enough to stand up in my seat, but I instinctively clapped a few times, and knew who was getting points when, and just generally figured it out, and had an great time because of it. I think this, then, is the life lesson the Yankees have taught me: Sometimes just showing up isn't enough - you have to be present, focused, energized. And also this: Baseball caps are really good for days when you don't have time to shower. Oh man, fly balls: I totally hid under my seat one time when I was a little kid & a fly ball was coming at us. It bounced off my dad's hand, hit some lady in the face & broke her nose. Dramatic.